Dr. Lindsey Jon Kintner was born and raised in Mishawaka, Indiana where he attended Mishawaka High School. He attended Hanover College and graduated in 1994 with a degree in Chemistry. Dr. Kintner continued his education at Indiana University in Bloomington where he received his Doctor of Optometry in 1998. Immediately following graduation, Dr. Kintner joined his father in practice and took over G. Frederick Speiser's practice. Since his return to Mishawaka, Dr. Kintner has become involved in the community through Lions Club, The North Central Optometric Society (which organizes school screenings for local elementary school children), and his church. He also stays active in his profession as a member of The Indiana Optometric Association, The American Optometric Association, and InfantSEE. Dr. Kintner has special interests in diseases of the eye, particularly glaucoma, cataracts, and dry eyes. He also enjoys working with children, contact lenses, and custom optical systems for patients with special needs and hobbies. Drs. Kintner and Shearer welcome Kirstin Rhinehart, O.D., as a partner in their eye care practice. Her interests include pediatrics and contact lenses. Dr. Rhinehart replaces Jonathan Kintner, O.D. who recently retired from the practice founded by his father, Kenneth, in 1937. Dr. Rhinehart received her undergraduate degree from DePauw University, Greencastle, Indiana and her doctorate degree in optometry from Illinois College of Optometry in Chicago, Illinois. 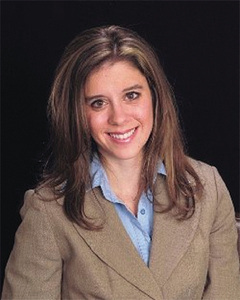 In 2003 Dr. Rhinehart joined The South Bend Clinic where she remained through October of 2009. Dr. Rhinehart is a native of the area, a current resident of South Bend and a member of the American Optometric Association. Dr. Charles Shearer was born in North Liberty Indiana. He received his optometry degree from Indiana University. When Dr. Shearer returned North to Mishawaka, he resumed care of the patients of retiring Dr. Lou Fishman. Soon after, Dr. Shearer relocated his practice just down the street to practice with Jonathan Kintner, OD. Throughout his career, Dr. Shearer has had particular interest in pediatric vision including vision training and visual perceptual problems. He also has interest in Sports Vision and continues to consult with the Colorado Rocky's baseball team.